Use your mouse to pilot the missile through the tubes. 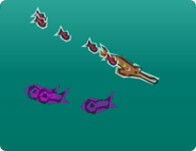 Fly through the holes in the obstacles to survive and reach the end of each level. The position of the mouse is the position of the missile within the tube.